Monday, March 26 – Much like our crater from last night, tonight we we’ll explore the lunar surface for another surface scar caused by a glancing blow. Head to the north near the terminator as the incredible Alpine Valley now comes into view. Cutting its way through the lunar Alps with a width of 1.5 to 27 kilometers and stretching 177 kilometers long, it is possible this unusual feature formed naturally, but it is unlikely. Viewable through binoculars as a thin, dark line, telescopic observers at highest powers will enjoy a wealth of details around this area such as a crack that runs inside its boundaries. No matter how it came to be, it is a very unusual feature and a lunar club challenge. Catch it tonight! While you’re out, this would also be a good time to have a look at Epsilon Canis Majoris – a great double star. While its companion is quite disparate at roughly magnitude 8, the pair can be easily separated with a small telescope. Tuesday, March 27 – Tonight as the skies darken, be sure to look for the bright star Pollux less than two fingerwidths away from the Moon. (1) Eudoxus, (2) Aristotle, (3) Caucasus Mountains, (4) Lunar Alps, (5) Valles Alpes, (6) Aristillus, (7) Autolycus, (8) Archimedes, (9) Mons Piton, (10) Mons Pico, (11) Straight Range, (12) Plato, (13) Mare Frigoris, (14) W. Bond, (15) Barrow, (16) Meton, (17) Cassini, (18) Alexander, (19) Montes Spitzbergen, (20) Mons Blanc. How many of these craters are lunar club challenges? Be sure to note your observations! Wednesday, March 28 – Born today in 1749, Pierre LaPlace was the mathematician who invented the metric system and the nebular hypothesis for the origin of the solar system. Also born on this day 1693 was James Bradley, an excellent astrometrist who discovered the aberration of starlight (1729) and the nutation of the Earth. And, in 1802, Heinrich W. Olbers discovered the second asteroid, Pallas, in the constellation Virgo while making observations of the position of Ceres, which had only been discovered fifteen months earlier. Five years later on this same date in 1807, Vesta – the brightest asteroid – was discovered by Olbers in Virgo, making it the fourth such object found. Your assignment, should you choose to accept it, is to locate both Pallas and Vesta. Both are viewable before dawn – with Vesta quite near M107 and Pallas not far from Mars. While asteroid chasing is not for everyone, both are bright enough to be identified with just binoculars. Use a resource like heavens-above.com to get accurate locator charts and keep a record of spotting these solar system planetoids! Keep in mind the name LaPlace as we’ll look for an area on the lunar surface named for him tomorrow night. Tonight we want to have a look at the Moon with either telescopes or binoculars to reveal two excellent lunar club challenges that are easily identified – Eratosthenes and Copernicus. Be sure to note both features and we’ll return in time to have a closer look at both of these incredible features. Thursday, March 29 – Today celebrates the first flyby of Mercury by Mariner 10 in 1974. Mariner 10 was unique. It was the first spacecraft to use a gravity assist from the planet Venus to help it travel on to Mercury. Due to the geometry of its orbit, it was only able to study half the surface, but its 2800 photographs gave us the knowledge that Mercury looks similar to our Moon, has an iron-rich core, a magnetic field, and a very thin atmosphere. Before we have a look at the lunar surface, be sure to have a look at what’s near! The planet Saturn is around 1 degree away from the Moon and this could be an occultation for your area. Be sure to check IOTA. 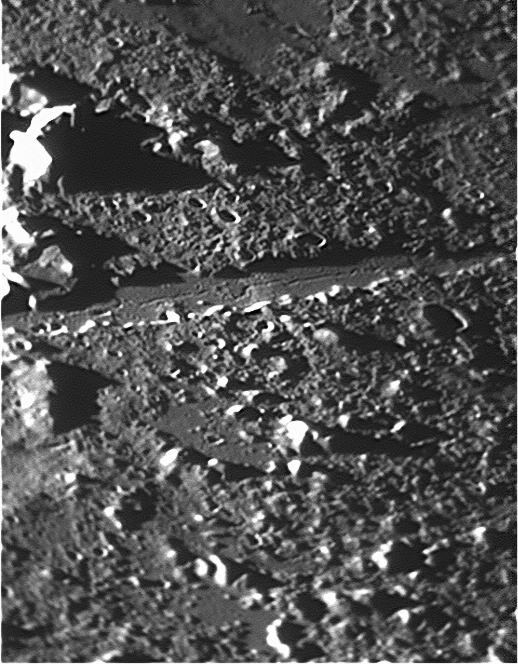 On the Moon, the terminator has now revealed the placid Sinus Iridum. The two features we will look closely at tonight are the Promontoriums which guard the opening of Iridum like two lighthouses. The easternmost is LaPlace, named for Pierre. Little more than 56 kilometers in diameter, it rises above the “Bay of Rainbows” some 3019 meters, making it almost identical to Buttermilk Summit at Aspen Park. Promontorium Heraclides covers roughly the same area, yet rises to little more than half of LaPlace’s height. Both are telescopic lunar club challenges so be sure to mark your notes! Friday, March 30 – Tonight as the Moon rises, look for Regulus to have taken Saturn’s place less than a degree away from the Moon. For some areas of the world, this could be an occultation, so be sure to check IOTA information. Tonight it’s time to walk the Southern Highlands again as crater Schiller comes into view. While Schiller itself is rather recognizable, as the Sun lights up the moonscape many craters change appearance as new ones become more dramatic. Let’s take a look at what can be seen during this phase and how many you can identify! (1) Sasserides, (2) Tycho, (3) Pictet, (4) Street, (5) Longomontanus, (6) Clavius, (7) Porter, (8) Rutherford, (9) Maginus, (10) Gruemberger, (11) Moretus, (12) Klaproth, (13) Casatus, (14) Wilson, (15) Blancanus, (16) Scheiner, (17) Kircher, (18) Bettinus, (19) Zucchius, (20) Segner, (21) Rost, (22) Schiller, (23) Bayer, (24) Mee, (25) Hainzel, (26) Lacus Timoris, (27) Wilson. Best of luck and be sure to use this map whenever this area comes into view! Saturday, March 31 – Although the Moon will be overpoweringly bright, be sure to have a look at its western edge for the dark oval of Grimaldi and the bright point of Kepler to its northeast. Today in 1966, Luna 10 was on its way to the Moon. The unmanned, battery powered Luna 10 was a USSR triumph. Launched from an Earth orbiting platform, the probe became the first to successfully orbit another solar system body. During its 460 orbits, it recorded infrared emissions, gamma rays, and analyzed lunar composition. It monitored the Moon’s radiation conditions – measuring the belts and discovering what eventually would be referred to as “mascons” – mass concentrations below maria surfaces which magnetically affect orbiting bodies. Sunday, April 1 – Today in 1960, the first weather satellite – Tiros 1 – was launched. While today we think of these types of satellites as commonplace, the Television InfraRed Observation Satellite was quite an achievement. Weighing in at 120 kilograms, it contained two cameras and magnetic tape recorders – along with an on-board battery supply and 9200 solar cells to keep them charged. While it only operated successfully for 78 days, for the first time ever we were able to see the face of the Earth’s changing weather. No matter how clear the skies are tonight, we’re not going to be able to escape the Moon! So let’s turn an eye towards an ever-changing planet – Saturn. Even a small telescope can resolve Saturn’s rings, and at high magnification you can see significant details. Look for things like the broad Cassini division in the ring plane, as well as the shadow of the planet on the rings. Be sure to take note of Saturn’s many moons as well! While Titan orbits well outside the rings and is bright enough to be noticed even in a small telescope, apertures of 4″ or more can pick up the smaller moons which orbit close to the ring system. No matter how you choose to look at it, Saturn is one of the most mysterious and fascinating of our solar system’s members.